When you move your head back and forth keeping the focus on the center dot, the circles formed by the rhombi seem to rotate. This illusion is a recent discovery found in 1999 by the Italian vision scientists B. Pinna and G. Grelstaff. 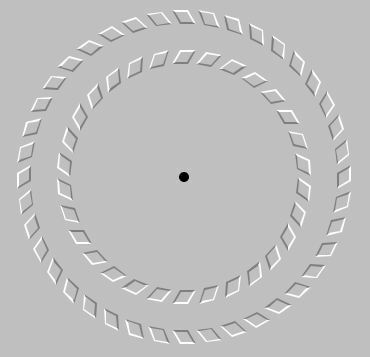 The applets demonstrates that the illusion persists even if only one circular arrangement is present, which appears to be a novel observation.